It’s no secret that I am a massssssive Lush fan and if I see a Lush shop, I am going in. 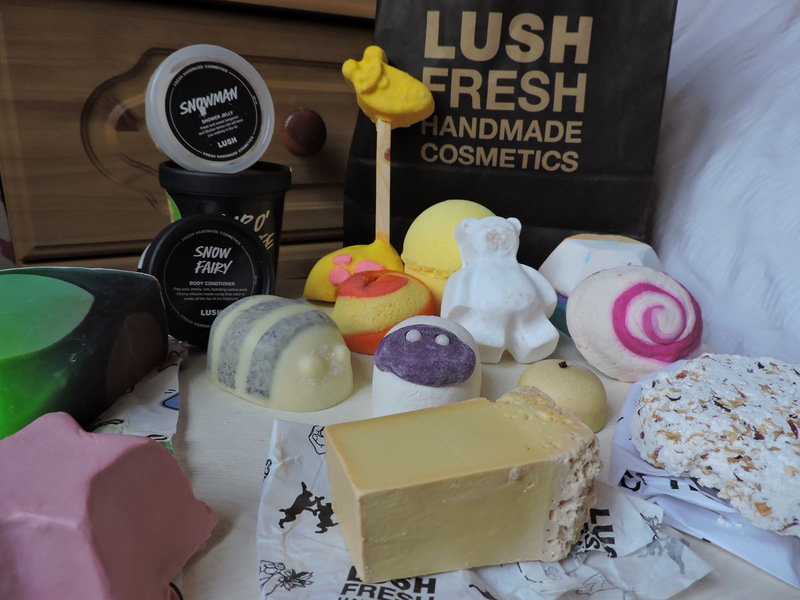 Today I went in to Lush and I really wanted to try something new, something cool, something that I hadn’t tried before so I brought a couple of things. I think Lush is amazing! 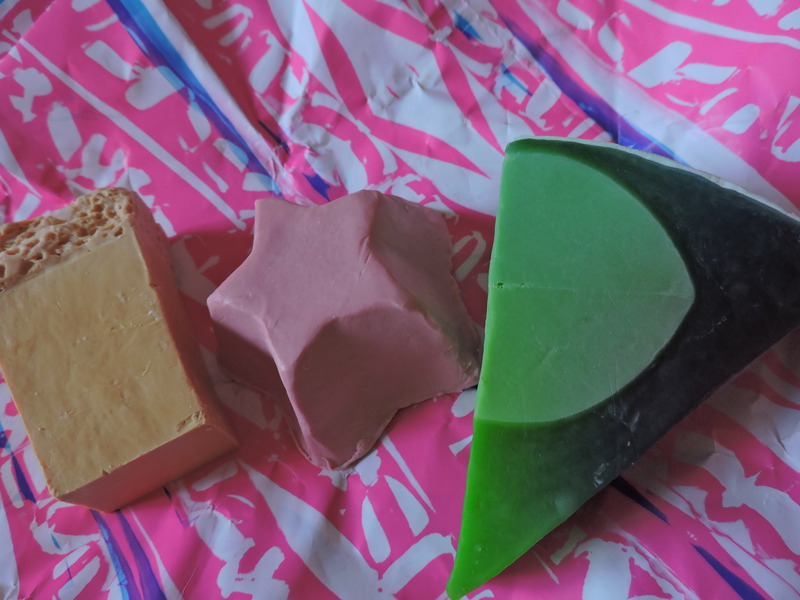 the products are really good, they smell delicious and are very affordable. They also make good gifts for people, because who doesn’t love a good bath bomb? What are these products and how do you use them?? A product that you put in your bath, it fizzes, creates bubbles and changes the colour of your bath. The colour of your bath will depend on the bath bomb you use. 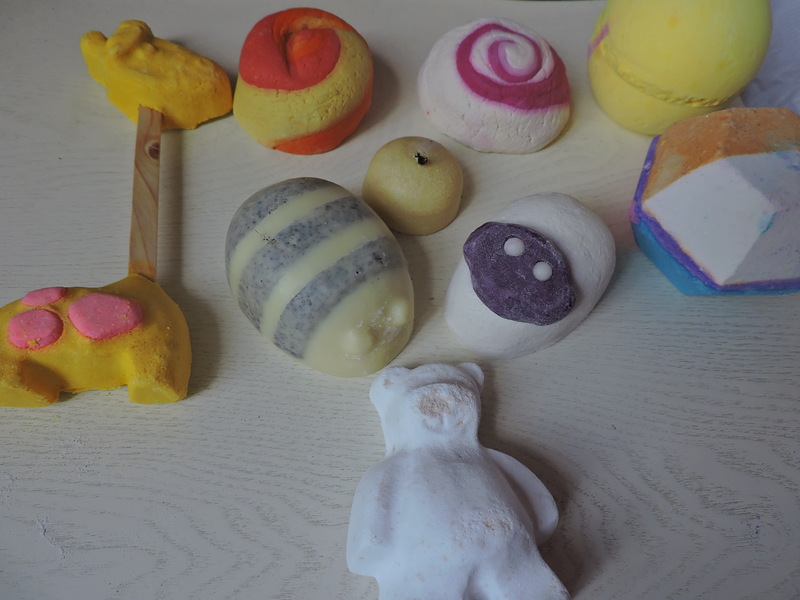 All bath bombs are different and use different ingredients to help your skin. They always smell lovely. Butterbear- this bath bomb is actually one of my all time faves from Lush. This adorable Bear moisturises your skin and leaves it feeling silky soft. It has Cocoa butter and ylang ylang inside, and the ylang ylang is used to make you feel super relaxed. It makes you want to fall asleep in the bath (obviously don’t). Cocoa butter is such a good moisturiser for your skin and you feel it working as soon as you get in the bath. I WOULD HIGHLY RECOMMEND. Fizzbanger- firstly, we just need to establish that this bath bomb has POPPING CANDY inside?! sorry what.. when I first got told this in the shop I was like whattttt I need this! The smell of this bath bomb is like citrusy apple with a bit of cinnamon. It makes you feel really warm and relaxed. Also, it has Petitgrain inside which is supposed to help reduce the feeling of anxiety. Experimenter- Okay so this bath bomb is literally like a firework display in your bath. There are so many different colours that come out of this bath bomb. It makes your bath very colourful, until all of the colours mix together, it leaves your bath a grey colour. Other than that, this sweet vanilla bath bomb smells nice. A product that you crumble under running water to create bubbles for your bath. They always leave your bath smelling amazing. Baa Baa- This bubble bar is literally the cutest thing ever. Its a little sheep, awww. It contains lavender, rose and ylang ylang so you would think it smells quite floral. But I think it smells a lot like Snow Fairy (if you are familiar with the famous Snow Fairy then you will love this Baa Baa bar). It has a very sweet smell and is milky in the bath. Brightside- Very citrusy! it has Sicilian mandarin, bergamot and tangerine oils which are meant to help uplift the skin and make you just look abit brighter all in all. This would be a good one to use in the morning before starting the day. Elsie The Giraffe (You’re Havin a Bath)- This is definitely the most creative product I have ever purchased from Lush, its so cute! This product is really good as it is a reusable bubble bar, so you can use it more than once, which I think is really good. Once again is very citrusy, it contains lemons and grapefruits and creates an enormous amounts of bubbles. The Comforter- this sort of looks similar to Brightside. It has a very strong fruity berry smell and turns your bath a lovely purple colour. This again creates a lot of bubbles, and you can always break bits off the bar and use it in your bath, that way you will get a lot more baths out of it. I’m guessing you know what a soap is..
Rock Star- I ABSOLUTELY LOVE SNOW FAIRY. I know Snow Fairy is one of Lush’s most popular smells and it probably isn’t a shock that I love the smell as most people do. This is me in a Lush product.. with the way it looks and the way it smells. Really creamy when you rub it on your body, smells incredible and ITS PINK! Baked Alaska- This soap is very bright, cheerful and just all around cool. It leaves your skin feeling very fresh and clean. The soap has a zesty lemon smell, and contains grapefruit oil, lemon myrtle and ylang ylang. Sea salted caramel- This soap literally smells like a hot sticky toffee pudding. It will make you want to eat it. It smells amazing! it has a very warm vanilla smell with a sea salt crust along the edges. It lingers on the skin for a very long time. A scrub that you can use on your face or body. Gets rid of any dead skin that you might have and buffs away any dry skin. Contains granules of some kind. 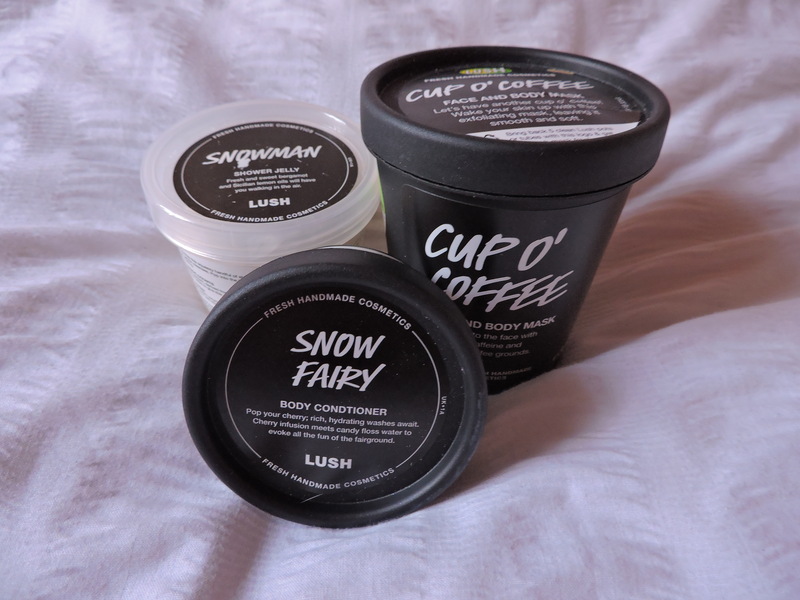 Cup O’ Coffee- I have never tried a face and body mask from Lush before so I was so excited to use it. It has a very strong coffee smell and contains coffee granules, so if you are a coffee lover like me, this will be right up your street. I love scrubs with granules, they are so good to get rid of dead skin and buff away any dry skin. This scrub brightens up your face, so I would suggest using it in the morning as it will wake your face up and prepare your skin for the day. Snow Fairy- This body conditioner is similar to a shower gel, although I would suggest rubbing it on to dry skin and then rinsing it off rather then getting your body wet first. This is just because when your skin is dry, it really lets the conditioner soak into the skin. This product is a mix between a shower gel and a soap. Used all over the body in the shower or bath. Snowman- This was actually in the Christmas range and there were such a good variety of Christmas jellys. You essentially rub this all over your skin when in the bath or shower and it acts as a soap. It has a fresh citrus smell and it rubs really nicely into the skin. You never really see products like this, so its nice to use something different. When you take it out of the box its in the shape of a snowman, HOW FUN?! I’m guessing you also know what a shower gel is.. Snow Fairy- the famous Snow Fairy but as a shower gel form. It leaves your skin feeling and smelling incredible. The smell lingers for SO long, you will still smell it on your skin the next day. With the shower gels you can get different sized bottles, which is good as there is a verity depending on what size you want. This product is a moisturiser, but in the form of a bar of soap. This particular one has coconut granules inside. Scrubee Body Butter- HOLY MOLY this bar smells fricking amazing. Even just from looking at it, you know it is going to do wonders to your skin. This is also another one of my favourites. I know this one is still quite new but I would HIGHLY RECOMMEND THIS product to anyone. It has such a strong smell of Cocoa butter and honey, it contains ground coconut shells. So its not only moistening your body but it is also buffing it. I instantly fell in love with it when I saw it in the shop therefore, I had to get it. This product goes in your bath and slowly disintegrates, it makes your bath really oily. Floating Island- this oil was the first bath oil that I ever used. 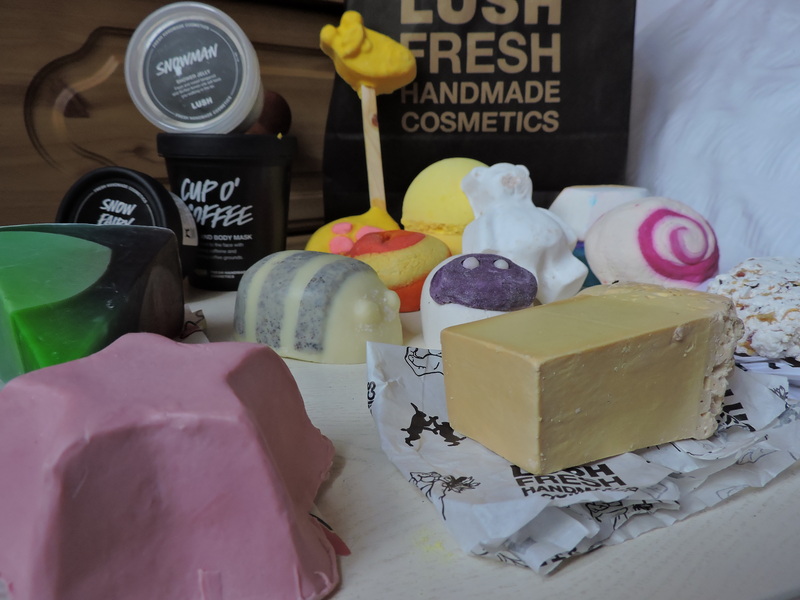 I was never really drawn to bath oils, but after the first time of using it, I knew that bath oils would become one of my favourite products from Lush. If you have dry skin this is going to be your life saver. When you put it in the bath and get it, you instantly feel it working on your skin. It contains sandalwood oil, vanilla bean, and lemon oil, oooo smells great. This product is a bath bomb for your feet. Foot soak and Fancy Fee- I brought this product purely just to experiment what it is like. The product itself really interests me as it is essentially a bath bomb for your feet. Other than the fact it looks like a massive snack a jack it smells really nice. It has a really lovely floral small, I need to emphasise that it is very strong. If you inhale it hard, you are more than lightly to cough or sneeze. Its very flaky and breaks off very easy. Its meant to be really good for your feet and make them feel smoother, so I just thought I would give it a go as I don’t use any foot products. I once bought the experimenter- but I touched it and played with it in the water and my fingers and nails turned pink for a couple of days, but it got off eventually. I want to try the floating island, I have dry skin! That is so strange that it made your fingers pink! It is honestly so good! Also try another one called ‘You’ve been Mangoed’ it is amazing for dry skin! Don’t know ~ they just did! Thanks for the suggestion. Love lush. Feel like I want to buy sea salted caramel now!